Kimba The White Lion -- the 1989 "New Adventures"
So it appears that the blame for the way this series turned out cannot be assigned to Kimba's creator. While it is true that there were some changes done to the original manga story to make the first Jungle Emperor/Kimba series, changes that were dictated by the American partners in its production, the older series is closer in spirit and content to Dr. Tezuka's original story than is this dark and depressing 1989 remake. As this series progresses, it gets more and more dark and depressing. The violence is unrelenting and there is no apparent optimism. Death is everywhere. Kitty becomes a morose, strangely weak creature. There is little happiness and no one would even think of singing in this version. This is not the Kimba that the world fell in love with. There is no magic, no emotion, no real connective power to the images; no flights of fancy, definitely no humor, no life. Whatever you loved about Kimba the White Lion, you won't find much of it in this remake. So much for the story content. Stylistically, it seems a goal in making the 1989 series was to update the story with a modern, more realistic look. It is amazing how much was lost by doing that. 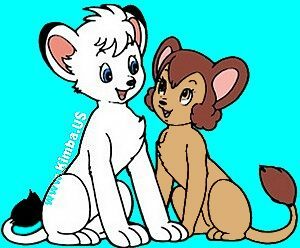 The original Kimba was done with complete awareness that it was a cartoon, with all the communicative possibilities that the medium provided. In the original Kimba, a character's emotions, motive, and plans could be communicated in an instant with a single image, because of the expressive, albeit "unreal", images and distortions that are possible in a cartoon. The visual style conveyed magic, power, humor, and emotion. The style of the 1989 Kimba series comes across as very stiff and stilted. This puts the majority of the storytelling into the dialog, the kind of situation Chuck Jones once described as "illustrated radio" (i.e., not good cartoon making). Still, the series did occasionally have some merit. Episode 2 showed some of the spirit of the original Kimba, even though it too was a definite downer. It is hard for English-speaking audiences to get to know this series, because it was ripped to shreds for its English-dubbed release to home video by Pioneer Family Entertainment. For example, Episode 2 and Episode 3 both were not included on those tapes. A lot of this series did not make it to those tapes. Some have speculated that Pioneer tried to manipulate the series into something upbeat. The Kimba completist will have to see this, but please read this review before you buy any of the English-dubbed videos. I couldn't have said it any better myself. To be fair, here is a more sympathetic review of these tapes. My episode guide for this series is here. The Pioneer videotapes are no longer being made. The table below is for reference, should you find used copies somewhere. The picures come from the Pioneer tape boxes. Something on this page was changed on 10 November 2009.